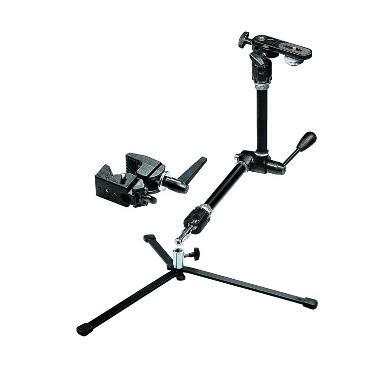 The Manfrotto 143 Magic Arm Kit is a heavy-duty articulating arm that locks in place with the simple turn of a lever. Attach it to your camera or umbrella with the included bracket or use the included clamp to mount the arm kit to anything that's 5"-2.1" thick, such as light stands, backdrop bars, poles, and other rigs. It is crafted from aluminum for maximum durability and is ideal for placing cameras in unique positions or for supporting accessories.